Dark dorm rooms can be downright depressing. To add some more lighting to your living space, add some dorm lights like this Radiant Dorm Desk Lamp - Blue. Whether you place this lamp for college on your dorm desk or on your dresser or dorm shelf, it'll add needed light so that you won't have to rely on overhead florescent light all the time. Don't kid yourself by thinking you'll be in the library every night and will need only a night light in your dorm room. There will be plenty of nights spent catching up on reading, and for that, you'll need a cheap college lamp. It's a must-needed addition to your supplies for college. Your dorm room items should be well rounded. Even though desk lamps for dorms are basic dorm items, they're no less essential, and are a necessary part of any college shopping list. 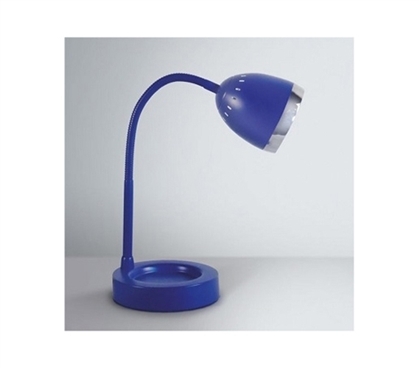 The cool blue color of this college desk lamp will also add to your dorm decor overall. Since most desk lamps come in basic colors such as black or white, dare to be different! It's the unique supplies for college that will give your dorm room some character. Even if this college lamps is just that, a college lamp, it's still a dorm supply that can enhance your dorm room and bring some much-needed light to your desk or even the whole room.